"who didn’t mind its shabby condition"
Unfortunately no riches came with the title, only the house and its grounds which had not been properly looked after for many a year. Mrs Byron and the little lord moved into Burgage Manor in nearby Southwell, renting Newstead out to other tenants who didn’t mind its shabby condition. "shared his love of pet dogs"
Although the teenage Byron found Southwell very boring, he did have good friends there, notably the Pigot family, including Elizabeth (1783 – 1866) who was a few years older than him and shared his love of pet dogs. 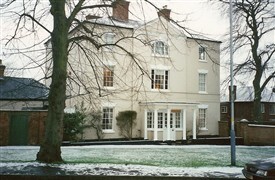 On the other side of the Newstead estate he often visited the Chaworths at Annesley Hall, especially the tragic Mary Anne (1785 – 1832), a distant cousin.